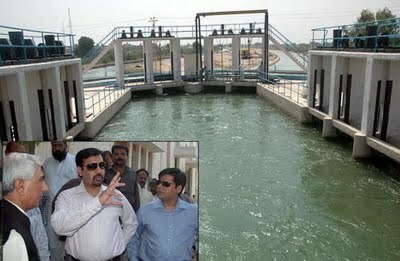 Had the city government not started cleaning storm water drains in March this year, the city would have been facing an even bigger cyclone threat today, argued Karachi Water & Sewerage Board (KWSB) Managing-Director Misbahuddin Farid on Thursday during a visit of relief camps and inspection of drain cleaning works. The KWSB MD inspected the Airport & Golden Town Nullah, Chakor Nullah, Manzoor Colony Nullah, PECHS and other Nullahs, as well as arrangements made at relief camps established in Landhi, Korangi, Bin Qasim and other towns. Farid was also briefed that the city government has set up 28 makeshift camps in city with the arrangements of accommodation and food for 70,000 affected. Deputation of doctors and provision of necessary medicines has also been done in these camps. The KWSB MD said that civic bodies have made the best-possible arrangements ahead of the cyclone, and the elected leadership was also in constant contact and giving directives under which a comprehensive plan has been made to deal with any untoward situation.